This book investigates the productive crosscurrents between visual culture and literary texts in the Romantic period, focusing on the construction and manipulation of the visual, the impact of new visual media on the literary and historical imagination, and on fragments and ruins as occupying the shifting border between the visible and the invisible. 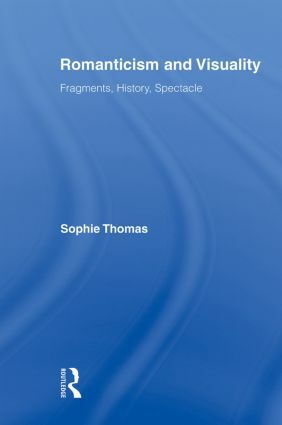 It examines a broad selection of instances that reflect debates over how seeing should itself be viewed: instances, from Daguerre's Diorama, to the staging of Coleridge's play Remorse, to the figure of the Medusa in Shelley's poetry and at the Phantasmagoria, in which the very act of seeing is represented or dramatized. In reconsidering literary engagements with the expanding visual field, this study argues that the popular culture of Regency Britain reflected not just emergent and highly capitalized forms of mass entertainment, but also a lively interest in the aesthetic and conceptual dimensions of looking. What is commonly thought to be the Romantic resistance to the visible gives way to a generative fascination with the visual and its imaginative--even spectacular--possibilities.